Stock photo of The Alhambra (La Alhambra) a moorish citadel and palace designated a UNESCO World Heritage Site in 1984, backdropped by the snowcapped Sierra Nevada mountain range seen from Mirador de San Nicolas in the Albayzin district at dusk, Granada. Red and green lights add to the evening glow of The Alhambra in the City of Granada. 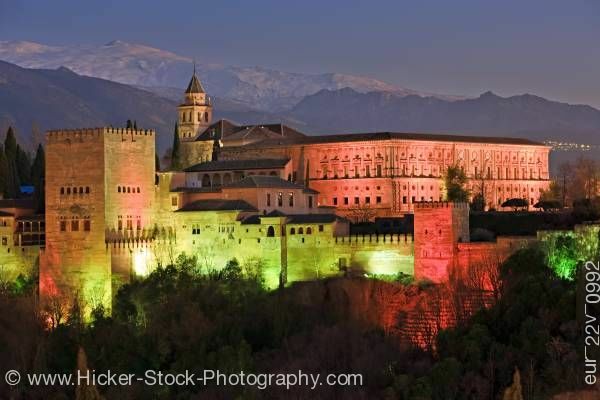 This stock photo shows an evening view of The Alhambra (La Alhambra) a Moorish citadel and palace designated a UNESCO World Heritage Site in 1984, back dropped by the snow capped Sierra Nevada mountain range seen from Mirador de San Nicolas in the Albayzin district at dusk, City of Granada, Province of Granada, Andalusia, Spain, Europe. Lights of red and green reflect on the distinct and grand Alhambra in the City of Granada. The Alhambra is a gorgeous historical view with its many towers and architectural beauty. The Alhambra has a gorgeous backdrop of the snow covered Sierra Nevada Mountains. The Alhambra (La Alhambra) a moorish citadel and palace designated a UNESCO World Heritage Site in 1984, backdropped by the snowcapped Sierra Nevada mountain range seen from Mirador de San Nicolas in the Albayzin district at dusk, City of Granada, Province of Granada, Andalusia (Andalucia), Spain, Europe.